For anyone not completely familiar with all the new features of our storefronts, we strongly encourage you to register for one of our FREE online training webinars. We at LabPrints want to do everything possible to help our customers get the most out of their online storefronts. We feel strongly that ours is the best storefront solution available today-the benefits of complete integration with your workflow software, the ability to choose and work with the high-quality lab of your choice, the highly configurable designs of the storefront interface, and many other factors, as well, all add up to an unbeatable solution that can result in a significant increase in your studio's sales! Here are some ideas that you might want to consider-you might find that these thoughts will spark new ideas that will work even better for your specialty and your clientele. Maximize your studio's "brand" by coordinating the look of your storefront with your website. Upload your logo, and choose a color theme that looks good with the rest of your marketing materials. We have nine different themes to choose from. Configure the storefront carefully-there are quite a number of options, so you can tailor the site to suit your taste...and your business. You can choose several ways for your customers to enter their event, and put all your contact information on the Storefront Homepage. Timing is important! The sooner you get your images posted online, the more excitement there will be on the part of those attending the event. We recommend that you post images within a week, or even less, after the event. Getting the word out that your photos are available is probably the single most important aspect of a successful Storefront. 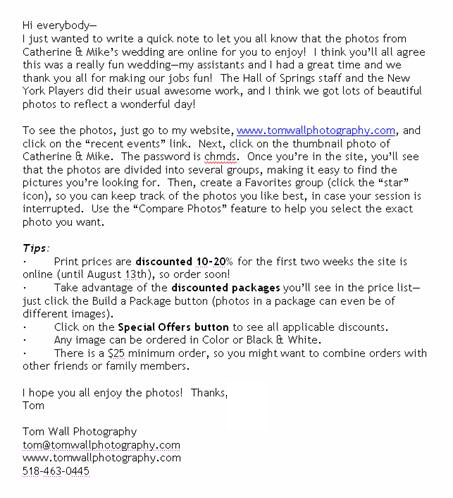 Some photographers rely on their clients to spread the word (inconsistent, at best); others hand out business cards and ask people to call the studio (often frowned upon by both the clients and the reception site). Distributing cards with the web address, activation date, and password is better, probably, but this approach requires the customer to keep the card, remember to look at it, and then go to their computer. The most effective way we've found so far is to collect email addresses at the event, and send a note to everyone who indicates they'd like to be informed of the event posting-this way, people are sitting at their computers when they get your email...and who wouldn't click a link to see your photos! Make your event photos look their very best! We recommend that you create groups in LP Digital Studio (to make it easier to find specific photos), and crop the images to eliminate unnecessary background space and/or center the subject, as appropriate. You might want to make a "Photographer's Picks", too. This can serve a couple of purposes. If you upload this group first, it can work as a highlights group, and many viewers may not even need to go further! If you choose a good variety of images likely to be ordered (portraits, family groups, etc.) and your more artistic photos, as well, it's also great marketing for your studio! Put your best foot forward, and show your best work off in the very first group people will see. Pricing is a critical topic, and has a huge impact on sales, of course. Today's economy puts a lot of price pressure on all businesses, of course, so providing a good value to your customers is essential. Some successful studios charge less for their online orders, both to encourage their customers to order this way, and also because it requires so much less time than a phone call or an in-person meeting. LabPrints Storefronts include several ways to offer incentives to your customers. You can create Special Offers-they can be time-specific or ongoing, discount on specific products or on the total order, and you set the price point where the incentives take effect. In addition, you can easily create Single- or Multi-Pose Packages, and even Photo Albums (where your customer can sequence the images, so you know what order they go in the album). Taking advantage of these features will increase the value your clients get, provide incentives for them to place orders, and should result in significantly greater sales for you, as well! Here's another idea that works very well-remember to send a reminder that your incentives and/or discounts are about to expire about three days before the expiration date. Also, send out another note just before the event expiration. Sending out these reminders will get the procrastinators moving! Of course, the execution of all these ideas will make a big difference in the image you create for your studio, and the results you get, as well. For some examples of the above ideas that you might like to implement (or improve upon! ), here's a link to my website (Click on the 'recent events' link at the upper right-this takes you to my LP Storefront homepage. Click on the Borden/Warner Wedding (no password required for this event)-I won't go into a detailed description of the Storefront here, but notice the "Build a Package" and "Special Offer" buttons on the Event homepage, and click on each to see what happens there. Then, click an image thumbnail, and select "Purchase Image"-this will take you to the prices page, and you'll notice that I have individual prints, prints with retouching services, Single- and Multi-Pose packages, and even a Photo Album. Click here for a printable PDF file of this page.